ALBUQUERQUE, N.M., April 3, 2019 /PRNewswire/ — Combining their unique strengths and abilities in image processing and color conversion, Cinnafilm and Technicolor announce a partnership to create an unparalleled solution for content owners, creators, and service providers. The joint solution will provide an incomparable file-based solution for high-quality High Dynamic Range (HDR) conversions from Standard Dynamic Range (SDR) source material, breathing fresh life into SDR libraries for OTT delivery, and streamlining editorial and production workflows for non-HDR content to be more seamlessly edited into native captured HDR material. Cinnafilm is integrating Technicolor Intelligent Tone Management (ITM) and Advanced HDR by Technicolor (also known as SL-HDR) as a feature set upgrade to the conversion capabilities of the renowned Dark Energy noise and texture management toolset. Technicolor ITM is an algorithm that tone maps and up-converts SDR video into a native HDR format. 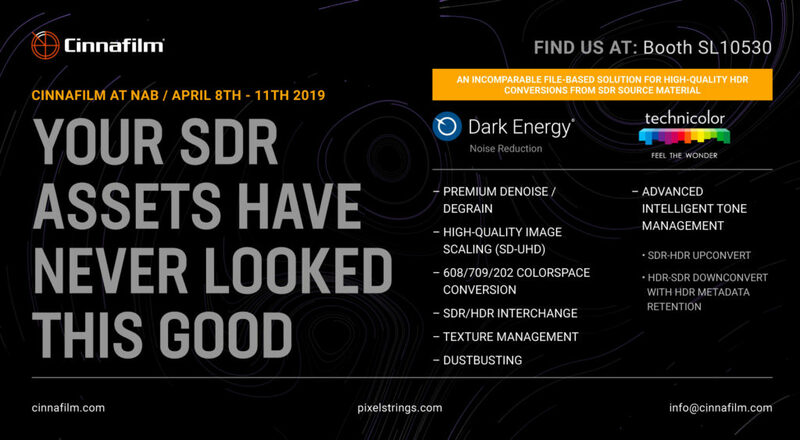 Dark Energy, a technology used for over a decade in many of the most prestigious post facilities in the world, removes digital noise and film grain from moving pictures without harming image detail and replicates any film emulsion or broadcast texture for a pleasing, final image. Jointly, this offering will bridge the gap between existing SDR workflows and source content material and the ever-increasing demands for HDR delivery. “We have been active in live production over the past several years with Advanced HDR by Technicolor; however, we needed a strong partner in file-based production that would add other aspects of the video toolchain like noise reduction. We believe partnering with Cinnafilm and combining the features of Dark Energy and PixelStrings to be a compelling solution for our customers,” says Thomas Bohan, Head of HDR Program at Technicolor. Dark Energy with Technicolor ITM will be made generally available in Q2 2019, directly from Cinnafilm as part of its array of award-winning enterprise software solutions. This summer will see the extended release of the solution within Cinnafilm’s PixelStrings PaaS pay-as-you-go cloud service, winner of the 2018 Hollywood Professional Association Engineering Excellence Award. By Q4, the solution will be available from several of Cinnafilm’s OEM partners. Conversions from SDR to HDR video can be exported as SLOG3, HDR-10, or HLG. In addition, the tool will be able to down-convert from those HDR formats to SDR Rec 709 and distribution including Advanced HDR by Technicolor. For a demonstration, please contact Cinnafilm COO Ernie Sanchez, sales@cinnafilm.com, or visit Cinnafilm at NAB 2019 in Lower South Hall, Booth SL10530. For more information about the solution, please contact info@cinnafilm.com. Cinnafilm, Inc. is a global leader in innovative video optimization solutions for television, film, and multimedia delivery. Harnessing the unmatched computing power of modern graphics cards, Cinnafilm’s patented, 100% file-based software solutions are rapidly changing the field of high-quality image processing. Cinnafilm software is in use today at many of the world’s premier, forward-thinking studios and networks, solving a wide variety of very complex imaging problems including but not limited to restoration and bitrate optimization, noise removal and texture-matching for digital cinema and film, and automatic retiming and standards conversions within real-time transcode workflows.